FOR SALE $27,500 REALLY SPIFFED UP... OR $ 15,000 AS IS.. Built 1988 Scripps Iron and Machine Works , Fredericksburg Tx. 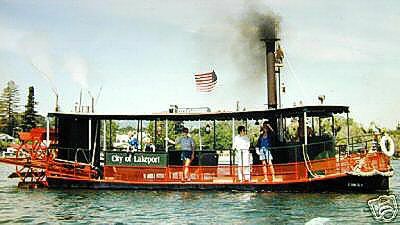 The Sternwheel Steam Boat " City of Lakeport" - ex Rio Colorado Princess -is For Sale.This Paddle Wheel Steamer is 45 feet long, 8 feet wide, and floats in 12-15inches of water. The vessel has a custom trailer. It can be transportedcheaply, without special permits. All steam machinery is in excellent working condition.It has always been a fresh water only boat.This vessel could easily be certified as a commercial passenger vessel for20 pax + crew. $ 27,500 with hull plating and paint renewed. $ 15,000 As-Is. Increasing with progressive upgrades.Builder says steam machinery is worth $ 15,000. Please no "how low will you go calls"... come see the vessel and we can talkseriously. Designer: 1902 Marine Iron Works - Feliz - and it's 4" x 16" engines. Reprint available from Elliot Bay Steam Launch Co.
45 x 8 x ~1 38' LOD Welded Steel built to workboat standards. Strongnot fancy. Flat Bottom, Hard Chine, Model Bow. 4 compartments - 3 hatches. Condensing tubes double as hull skids. 39" rails, 3 entry gates, wheel chair accessable. RV type head. 2 welded steel diesel tanks 27 x 17 x 48 each. 1 welded steel water tank ( under boiler) ~ 4' x 4' x 6"
7' dia x 6' wide wheel 12 floats ~ 30 rpm at top speed. 85 sq ft Babcock & Wilcox type horizontal water tube boiler. Professionalnon-ASME. Built 1988. Hydro'd @500 psi new, 300 psi annually, relief set 150 psi. Havedocs. 3 feed pumps : stainless crosshead, Gardner-Denver duplex steam, manualsimplex. Pair of 4" x 16" D valve double acting cylinders 12 HP. Marine Iron WorksDesign.with single lever reversing gear, cross head pump, pittman arms,eccentrics, bearings, etc. No hot box or vaccum pump, but everything else is there for condensing. The vessel is a fully functional steam powered yacht, cruise 6 knots, topspeed of 8 kts. With spacious decks, and over 70 feet of passenger railing, the Steam Buffcan count onmemorably sharing his passion with numerous happy guests, paying customers,or fellow club members, aboard this sturdy and picturesque paddle wheeler. All steam equipment is in working order. March 2005 : The vessel was thoroughly inspected. Some hull platingdeterioration under the boiler and tanks was noted. Balance of the hull,all decks, and railings are excellent. May April, 2005 : The hull is scheduled for professional replating underthe boiler and fuel tanks, making it virtually rust free. After repair,hull, deck and rails will pass the most rigorous insurance survey.Millerick Bros. in Sebastopol ( who built the Rose charter sailboat whichsails out of SF...and Tule Princess steam boat) will do the work. They areartists at thier craft. The boiler, steam engines, pumps, gauges, and associated machinery are allin working order. This Paddle Wheeler can be trailered on any road without special permitsbecause of it's 8 foot width. So you can easily explore new cruisingareas, go to steam boat festivals, or serve different winter and summermarkets, if you use the boat commerically. The trailer shown is included in the sale. Minimum tow vehicle is a 1 tonwith dualsand 5th wheel set up, capable of towing 14,000 lbs or more. For longdistances, we say hire a professional with a diesel tractor. Vessel gear includes all necessary safety equipment including: yacht ratedlife jackets, new fire extinguishers, danforth anchor, steam whistle,running lights, spot light, and flares. Height on trailer 12' 6''..reducable to 10'6"Bridge Clearance Approx 8 feet. 4 Compartments - 3 water tight bulkheads - 2 access hatches. 3/4 x 3/4 square tube passenger railing and canopy supports. 1" round chine bar - full length. Topsides - marine enamel over anti-corrsive primer. Deck: marine enamel with non-skid . Boarding Gates: 3 Port-Starboard- Bow. Head : Enclosed Port-a-Pottie with manual Pump Out. Full gauges, sight glasses, try valves, and controls on boiler. Double redunant feed water pump capabilities. Professionally restored : $ 27,500 with renewed hull plating, painting,and canopy. We are glad to sell at any stage of completion. The less we have to do thebetter ! We Will Sell The Steam Machinery Only : Builder estimates value at $ 15,000Boiler, Engines, Pumps, Pittmans, Eccentrics, Tank, complete. Submittserious offer. We have builders plans, and feel the hull can easily be USCG inspected forprotected waters, perhaps Lakes Bays and Sounds... with diesel, electric orhybrid power.